It's the time of year when I feel like I can't catch my breath for all the running-running-running I need to do. Everything happens at once during these May weeks. I love to be busy, but I don't relish the feeling of needing to be in several places at once. Lately, we've been seeing the doctors again for the LB, which is never easy, but the news has mostly been positive. This time last year, we were preparing for a major surgery, in addition to everything else we needed to do with the school year winding up, and we're glad not to be doing that now. Seeing the doctors again isn't so bad; in a way, they begin to feel like friends. We're fortunate to have good people to help us care for him. It's a Saturday at home for us. We're watching Home Improvement on DVD and relaxing. The small Bears have runny noses and with the biggest school and ballet events still to come this week, we're just taking it easy this weekend. I was crocheting a bit earlier but I have to tell you that I'm feeling very uninspired at the moment. I'm sure some of it is just the time of year, but I'm also feeling out of ideas. I've been halfheartedly crocheting squares from the Paeonia pattern I shared a few weeks ago. I did the math; I have to make nearly 300 of them to have a blanket sized for my bed, and I'm afraid I'm just not feeling it enough. 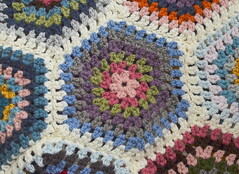 I'm thinking about big, basic granny squares instead, joining them with gray outer rounds. I've pinned a few granny afghans lately, like I just started crocheting (my crochet pinboard is here, if you're interested). I like Paeonia, but I'm undecided. 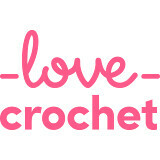 Maybe it's time to have a little crochet break and do something else for a while instead. I do have sewing and cross-stitch projects that need attention. Too many projects? Undecided and uninspired - this is my crafting phobia. This week, I received another email from someone who wants to help me "brand" my blog. I get these emails fairly often. I ignore them. This particular company wanted to help me design clothing that would boost my "brand recognition." Well. I have a style to my blog, and a color scheme, but I'd hardly call that a brand. I didn't engage with the offer, of course, but it made me think about what kind of blog I actually have. It isn't a craft blog; I see myself as more of a dabbler - an enthusiast - than an expert. It's not a food blog, though I enjoy sharing recipes that I've tried and liked. I don't have a farm, or a large family, or religious content. I've made a little bit of money with my blog but it's hardly a business. I'm pretty hopeless with social media; I don't think I've scrolled through my Instagram feed yet this month. Maybe I don't have a focus but I like it this way. I've spent too much of my life worrying about what others think; finally, now that I'm in my late thirties, I've been learning how to let go. It's liberating, and I wish I'd figured it out sooner. Life is so much easier when you aren't imagining that everyone thinks you're ridiculous. I started blogging with the idea that I would write about the good, positive things in my life, to help me appreciate them more, I think. Everyone hopes people will read their blog; I've had modest success, which keeps me going too, of course, but this whole blogging gambit, for me, is mainly about the small things in life - the ones that make me happy and remind me of what's important. I write about my hobbies, my family, or the season, or the sunset or my backyard flowers. So that's my focus, I think - simple, happy things. I'm glad others out there enjoy the same kinds of things I do. It makes me happy to know that people like to stop by and see what I've been up to. You're good people, I like it when you come around. Pull up an afghan, stay for tea. I'm working on an afghan, it's basically one big granny square because I couldn't stand the thought of having to do a bunch of small ones. I like the title of this post, it made me think with each photo. I like your eclectic blog and it always makes me happy and peaceful when I stop by. I love your blog as it is. You don't need a "brand." You are you! P.S. 300 granny squares? You are brave. Granny squares make me crazy. I'm another who likes your blog the way it is. It doesn't have to have a particular theme or be "branded" to be good. In fact, I much prefer the blogs that are down-to-earth and where the blogger talks about a variety of things going on in their life. Hope you're having a good weekend! Oh Jen I love your humbleness regards your blog, and the offer you declined to add more to your blog. I love the what your blog is all about its just right!! I find your blog to be very calming in such a whirling blogosphere. I feel the same about my crochet at the moment, nothing is really interesting me, but it has happened before so I am waiting for the feeling to pass. Enjoy your weekend, we are also becoming homebodies after such busy weeks away at school and work and it is lovely to just stop and breathe. I like your focus and your blog does just that, it celebrates the little things in life and that is perfect. I started as a knitting blog and really should change the name of it as it is about so much more than that. I dabble in everything and have very, very modest success, but I love those I have met through this wonderful land we share. 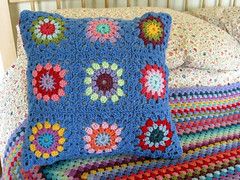 The crochet squares are lovely, they would make a beautiful blanket but 300 is a lot to crochet if you're not feeling it, perhaps after a little break you'll feel differently. I enjoy your blog the way it is, a little bit of everything. You never get bored with blogs if they touch on a number of subjects. I love your blog just the way it is, I avoid 'branded' blogs they are not my thing at all. I'm struggling with my crochet at the moment as I keep making stupid mistakes. I think I need something that needs less concentration at the moment. Sometimes a change is good. Keep going! You light up my day each time you post on your blog!! Hi Jennifer. I love your blog just the way it is. Although we have never met, I feel we are friends and would enjoy sitting down with you and crocheting or cross-stitching together. Gosh, my blog must be boring...no one has ever approached me about selling anything or branding either. :-). That's just fine with me. I seem to have so many things going on craft wise right now. A blanket, a gift, some charity projects. I can't seem to settle on anything at the moment either. Ten minutes here, twenty there and it seems not much gets finished. Wow, Jennifer, you take beautiful pictures! Such vivid colors and lovely poses. Love your blog, Jennifer! You're part of my Sunday morning blog reading list! Don't change unless you want to. Your blog is delightful the way it is! In fact, I read all your archived posts as well! Yes, I can relate to that. I started blogging because I wanted to record the little things, to share and enjoy them, and to connect with others who appreciate them too. It's good to look back at the small memories and details that often disappear, sidelined by the big events in life. I get random offers coming in but tend to ignore them. Perhaps if they related to something I genuinely believed in, or tied in with my own philosophy, then maybe. But they don't. So I'll just keep going in my own direction. I really enjoy your writing and reading your views. And I'm 41 on Wednesday and only recently decided to forget what others think. Not easy to do but with a bit of practice it is indeed very liberating. Hi Jennifer, your blog is delight. I enjoy dropping by to hear about things in your world that have meaning to you and your family, many of which resonate with me despite living on another continent. It's the little things that are important and simple pleasures. It's great to be able to share in them too. You do not need to be "branded" you are fine as you are and doing OK. I am feeling a little undecided about projects at the moment I always like to have a long term project that I can dip in and out of with smaller projects going alongside. Take care. I turn 40 in December and I totally get it! one, no need to be 'branded' I think people come to another's blog because they find common interests and a 'voice' that they like to hear. You are no exception to this! It's WONDERFUL to get a bit more comfortable in who we are and who we are becoming and not so anxious about what others think! that last paragraph was perfect.. everyone has their style.. not everyone blogs for the sake of turning it into a business.. it is like a digital diary, a wonderful way to look back.. and while it may not fit into any particular niche.. it is one of my favorite place to come.. you blog is warm and feels a bit like home..